Why, oh why, did I make more bread? We already had a homemade loaf on the counter. It was given to us as a bon voyage gift from a friend/client, Anne. She's a wonderful lady who I worked with in 1994 on the St. George's Round Church Restoration project. Oh right. I was bored. It’s not like someone here wouldn’t say there’s lots of unpacking to do (because believe me there is), but sometimes you have to take a mental break and do something different than what you were. You know – a change is as good as a rest. I had to do something other than just sit down. My spouse was going full-tilt boogie unpacking from our move, and I couldn’t look like I was doing nothing. I feel guilty when he's working hard and I'm not holding my own. This isn't one of my overnight autolyse rise breads. This can be accomplished in just a few hours. So if you’re reading now, you can have bread today. 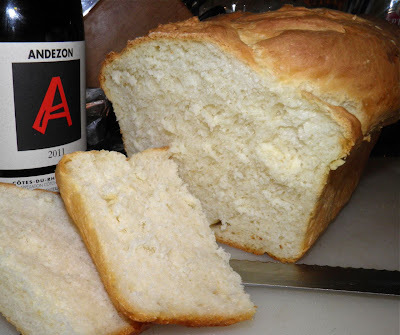 It's far cheaper to make bread than buy it, and it tastes so much better. It's almost all "down time" waiting for it to rise, so saying it's too much work is a poor excuse. You can easily do a thousand things while the bread is rising. I wanted a loaf that would double duty as both a dinner bread and sandwich bread. They're not mutually exclusive but can be substantially different. I like my table bread crusty and substantial. 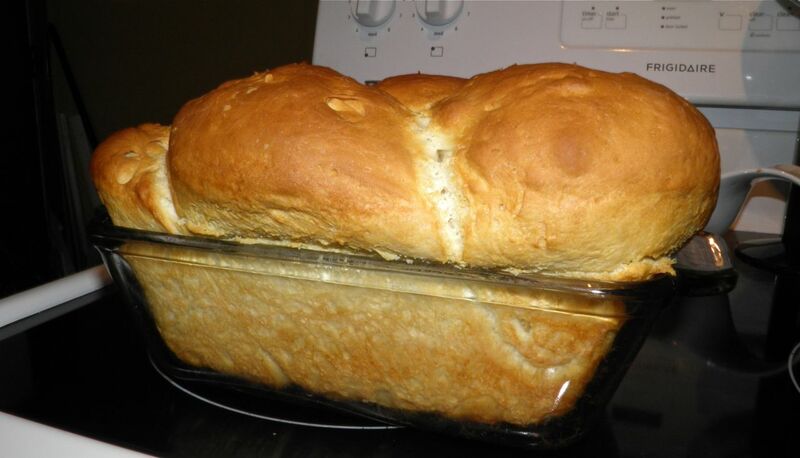 I decided to make a "cream" bread. It's soft enough for sur le table while being substantial enough to be sliced for thick-stuffed sandwiches. Bread is really something all of us should be making. Get up, mix some stuff together, and forget it. Or use one of my other overnight recipes and bake it in the AM when you get up. Is sleeping while you make bread too hard? No. Even though cost is a factor ($4+ for “artisan” breads at the grocery), for me it's more what is put in bread to sustain freshness on the shelf. Real bread only lasts a few days – not a week. It's quite rewarding to see what started out as a a few cups of flour rise to golden glory in the oven. And the smell in your kitchen is better than a stiff drink to relax frazzled nerves! Since one usually makes bread in the morning it’s probably wiser than a stiff drink at that time, too! You'll notice there's no salt in this loaf – just what's in the butter. Its absence adds to the sweetness of each slice and is better for anyone with high blood pressure. As an aside, as soon as I get a proper jar I’m going to try to capture wild yeast for sourdough starter. It sounds like it’s fairly easy and once established almost impossible to kill. As long as you feed it. Just what we need, another “pet”! Heat the butter, sugar, water and cream to 110-115°F. 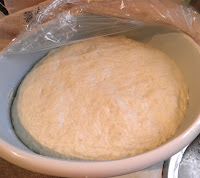 Pour over the yeast in a small bowl and allow to proof for 15 minutes. 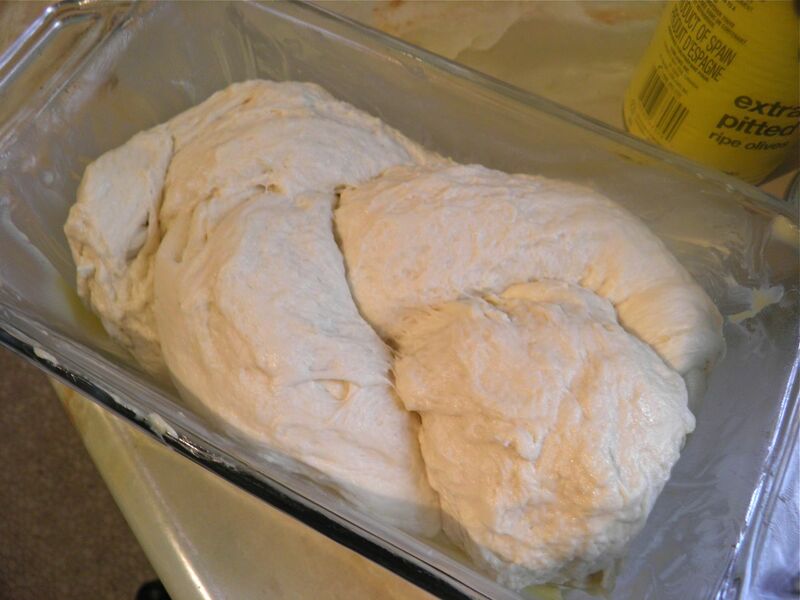 At the end of the time, if the yeast has become foamy, add the flour. If not chuck it out and start with fresh yeast. Add the flour and mix together. Then knead briefly on a flat surface. Use as little additional flour as you can. It will still be quite sticky. 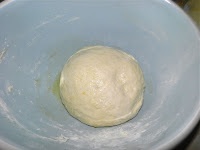 Place the dough in an oiled bowl. Cover with plastic wrap and a towel and let rise for 2 hours, until at least doubled in size. At the end of the time punch down the dough and divide into three equal pieces. Roll each piece into a 12" cylinder. Braid the cylinders together and then place in an oiled loaf pan to proof again for 1 hour. Preheat the oven to 425°F, with a pan of water on the bottom rack. This hydrates the oven and gives the maximum lift to the bread when it starts to bake. Bake for 10 minutes with the water pan in the oven. Remove the pan and bake for a further 20-25 minutes until golden brown and it sounds hollow when tapped.